Photogenic Olympic™ skier Lindsey Vonn has created a culinary opportunity, trying to heal her bruised leg by applying fresh curd cheese. She calls the soft stuff by it’s Austrian name, topfen, but the cheese is also known as quark, quarg, Tvaroh, Tvorog and curd-cheese. 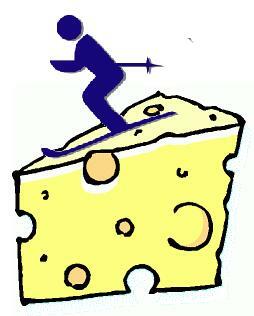 Fresh cheese aroma is too subtle for a marketable celebrity fragrance, so it’s time to profit by cookin’ up some celebrity ski cheese recipes. The therapeutic effectiveness of topical topfen application is dubious. ; perhaps this is a folk cure developed by Austrian skiers. 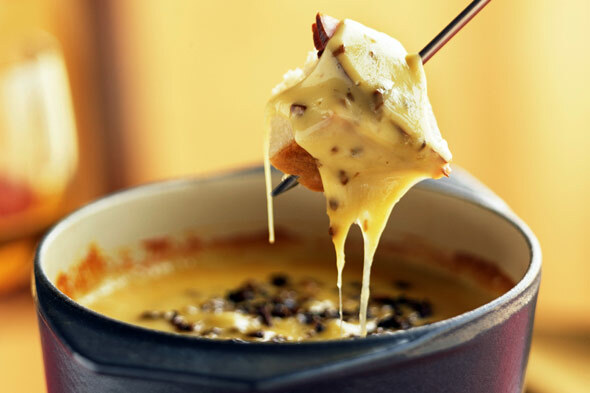 Who knows; maybe Swiss skiers try to heal injuries with warm cheese fondue. The very word Olympics™ is a registered trademark of the IOC, an athletic organization which endorses junk food, some of which contains glops of melted dairy by-products. The term is used here under the parody clause of the Fair Use Doctrine. Image by Mike Licht. Download a copy here. Creative Commons license; credit Mike Licht, NotionsCapital.com . Yes, we know that’s Emmenthaler — fresh cheese makes a lousy cartoon. This entry was posted on February 14, 2010 at 12:03 am and is filed under folklore, food, health care, Olympics, sports. You can follow any responses to this entry through the RSS 2.0 feed. You can leave a response, or trackback from your own site. Update: AP documents the medical properties of topfen by interviewing two workers in an Austrian cheese store (via the Washington Post. ).